Alpacas are one of the most beautiful members of the camel family. They are related to the llama. Alpacas are native to South America, high in the Andes Mountains of Chile, Peru and Bolivia. 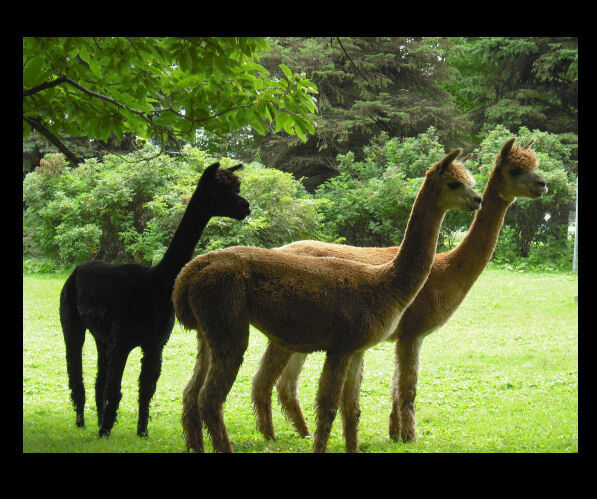 Alpacas are the most agriculturally friendly of livestock animals. They live lightly on the earth. Alpacas produce one of the most luxurious natural fibers found anywhere in the world! They grow a silky, soft fiber that has unique thermal properties due to microscopic air pockets. These pockets allow your skin to breathe on warm days, and also traps body heat in cold weather. The fiber naturally wicks moisture from the skin, keeping you dry and discouraging irritation. It is also extremely durable and elastic. Alpaca fiber is considered to be naturally hypoallergenic because it doesn't contain lanolin, is itch free, and can be worn by people with sensitive skin. It can also be dyed a variety of colors. Please Message, Sharon & Scott @ sandshaven.